Punjab Group of Colleges is one of the largest college networks in Pakistan. First college of PGC was established in 1985 in Lahore and now Punjab Group of Colleges has over 230 campuses in many cities and towns of Pakistan. Mian Amer Mahmood is the Chairman of PGC. He is also Chairman Board of Governors University of Central Punjab, Chairman Allied Schools, Chancellor Muhammad Ali Jinnah University, and Chairman Dunya TV Channel. Punjab Group of Colleges established following two colleges in Gujrat to fulfil the rising demands of science and commerce students of district Gujrat. 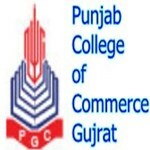 Punjab College of Commerce is located on GT Road near GTS Chowk. College has Science and Computer Labs, Library, experienced teachers, purpose built campus building, air-conditioned spacious classrooms, parking, canteen and pick and drop facilities. The college has E-Learning Facilities i.e. Software, Audio Video aided Multimedia, Animated Lectures etc. Students of this college has won many awards and prizes in national and provincial competitions. Punjab College offers various scholarships and rewards for brilliant students.